Will Smith celebrates 50th birthday by heli-bungee jumping across the Grand Canyon. West Philadelphia native Will Smith — who now has a mural here — turned 50 years old on Tuesday. There's only one way for a guy like Will Smith to celebrate such a momentous milestone: risk his life in front of millions of viewers. 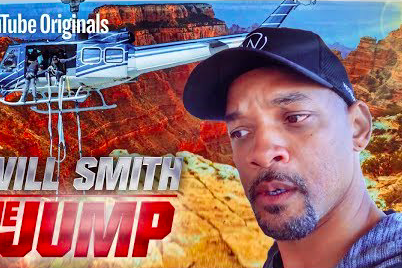 Back in May, the motivational YouTube channel Yes Theory challenged Smith to try heli-bungee jumping — that is, bungee jumping out of a helicopter. Never one to back down from a challenge, Smith accepted and said he would do the whole thing over the Grand Canyon for maximum effect on his 50th birthday. That day has finally arrived. Smith will complete the stunt live on his YouTube channel at 6 pm. In the lead-up to the big jump, Smith took to Instagram to go over some final preparations. Those included a test dummy whose leg appeared to fall out of its joint. It looks like Smith might have some nerves. One of the biggest miscalculations of Will Smith's career was turning down the lead role of Neo in "The Matrix," opting instead to star in the eventual flop "Wild Wild West." "The Matrix is a difficult concept to pitch," Smith said of his decision. "In the pitch, I just didn’t see it. I watched Keanu Reeves' performance – and very rarely do I say this – but I would have messed it up. I would have absolutely messed up 'The Matrix.'" For Smith's sake, we'll hope he's since learned what it would have taken not to mess that movie up. Watch the whole stunt live in the video below.